In August 2004, Alex Gray was competing in the Quiksilver Pro in Hossegor, France, when his parents visited with news they wanted to tell him in person. Jimmy Miller had killed himself in his parents’ Manhattan Beach home. Miller had been Alex’s older brother Chris’ Junior Lifeguard instructor. He had taught Chris to surf and Chris had taught Alex to surf. What Gray described as “an unfortunate, common bond” between the Gray and Miller families deepened. Six months earlier, Chris Gray had died of an overdose. Irons was the ASP World Tour champion in 2002, 2003 and 2004. Enroute to his 2004 title, he won the Quiksilver Pro Gray was competing in when his parents told him of Miller’s death. Irons’ father Phil grew up in Torrance and moved to Hawaii to surf in 1970. “Kissed by God” recounts Andy Irons’ legendary rivalry with 11 times World Champion Kelly Slater. More significantly, the film explores Irons’ losing fight with bipolar disorder and drug addiction. He died in 2010 of a drug-related heart attack in a Dallas hotel, on his way home from a contest in Puerto Rico. He was 32. The film ends with scenes of Irons’ wife Lyndie and son Axel, born two months after Andy’s death. “That ending was more powerful than I was prepared for,” Gray said as he struggled to speak from the stage, following the screening. “Something like that is hard to relate to until it happens to someone you know. I suspect many of you in the audience, unfortunately, know this,” he said. Steve Carranza’s portrait of Andy Irons was raffled off at the “Kissed by God” screening in Hermosa Beach. Miller asked Gray to talk about Irons. The year after his brother’s death, Gray said, Red Bull invited him on a Fiji boat trip with Andy Irons and his wife Lyndie, Irons’ brother Bruce and Australian pro surfer Mick Fanning. When Irons died, Gray was living on the lower floor of the Volcom house on the North Shore, in Hawaii. Bruce Irons lived on the second floor. Gray said he almost gave up surfing after his brother’s death. Neither Gray, Miller nor Bruce Irons romanticized the losses of their brothers. The Miller family responded to their son’s death by founding the Jimmy Miller Memorial Foundation. The foundation offers ocean therapy. Gray’s parents founded a parent bereavement group. 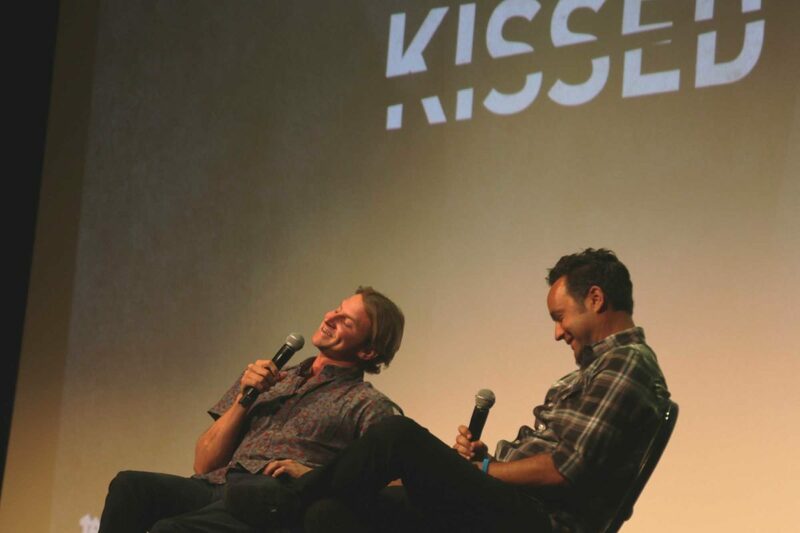 The “Kissed by God” screening was sponsored by the South Bay Boardriders Club and the Jimmy Miller Foundation. For more information visit JimmyMillerFoundation.org and Agray Surf Therapy on Facebook.